Rumors about the acquisition of Farecast are accurate – in a very brief blog post CEO Hugh Crean says they’ve been acquired by Microsoft. SeattlePI, which first broke the rumor last week, says the price tag was $115 million. While the two companies are an understandable fit given their proximity and partnership over MSN Travel, SeattlePI reports that Farecast entertained multiple offers before accepting Microsoft’s. 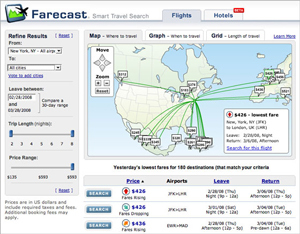 Farecast is an airfare pricing comparision tool that also uses a predictive algorithm to recommend when you buy your ticket. So the idea is to show the user not just who has the cheapest ticket, but whether or not waiting might make sense as well. The site has also guarantees tickets at its predicted prices for an extra charge. As of this past fall, it also began helping travelers determine the fairness of hotel pricing. The deal follows the acquisition of competitor SideStep by Kayak in December.